Photo: Thomas Henrikson EDITORIAL No. 2 • MAY 2015 Several of the stories in this issue force us to change our perspective, ask us too view the world from a new angle. We have interviewed Rajendra Singh, this year’s Stockholm Water Prize laureate, who brought water, and life, back to the poorest, driest parts of India. Not by using advanced, new technology, but by reviving ancient Indian knowledge about water harvesting and conservation. Now, he is sought by Western governments to advise them on flood prevention and management. Find out more on page 8. In California, home of the most advanced technology firms in the world, people are experiencing the worst drought in a millennium. Technology cannot (not yet, anyhow) make it rain. Lack of water, our most precious resource, has caused relations between competing water users to deteriorate to new lows. But the writer of this issue’s Last Word, CONTENT 03 05 08 09 BRIEFING Water news roundup COVER STORY Coming together in Kaliningrad INTERVIEW Rajendra Singh FOCUS Should we ban the burger? PRINTING 13,000 • CIRCULATION 40,000 ISSN 1102 7053 A CHANGE OF PERSPECTIVE James Workman, is an optimist nevertheless. Read why on page 14. In the cover story, we read about the need for further cooperation to save the Baltic Sea, one of the world’s dirtiest seas in one of the world’s most developed regions. Coming together in Kaliningrad, on page 5. 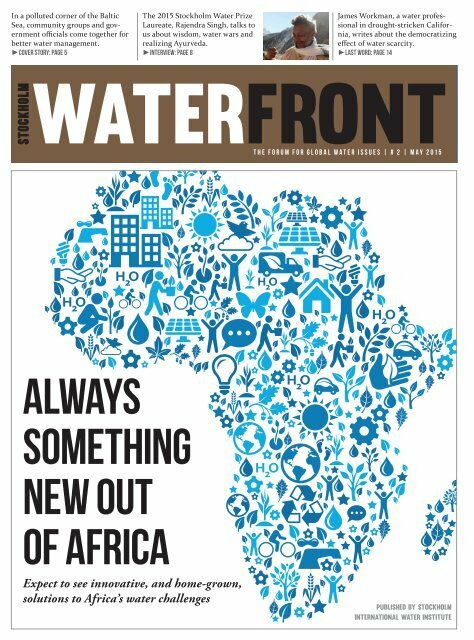 And in our analysis, Anton Earle draws Aristotle into his reasoning about Africa, the continent’s water challenges, and where the solutions are likely to come from. We hope that this year’s World Water Week, themed Water for Development, will offer plenty of opportunities to discuss new perspectives and solutions, based both on ancient wisdom and advanced technology. The registration has opened, and it is time to book your ticket to Stockholm! Torgny Holmgren Executive Director Stockholm International Water Institute The printing process and paper have been certified according to the Nordic Swan label for environmental quality. 10 13 14 15 ANALYSIS Africa: growing thirstier OPINION Make bacteria work for us LAST WORD James Workman CALENDAR Coming up in the water world COVER PHOTO Istock STOCKHOLM WATERFRONT Stockholm WaterFront is a quarterly magazine that aims to inform the global water debate and be a source of knowledge and inspiration for professionals worldwide with an interest in water issues. Stockholm Water Front mixes popular science articles with news reporting and carries analyses by some of the world’s most knowledgeable water writers. It is published in print and digitally by Stockholm International Water Institute, and is free of charge. STOCKHOLM INTERNATIONAL WATER INSTITUTE Box 101 87 Visiting Address: Linnégatan 87A SE-100 55, Stockholm, Sweden Tel: +46 8 121 360 00 Fax: +46 8 121 360 01 | www.siwi.org PUBLISHER Torgny Holmgren | Executive Director EDITORIAL STAFF Victoria Engstrand-Neacsu | Editor Elin Ingblom | Graphic Designer FEATURED CONTRIBUTOR EDITORIAL BOARD Britt-Louise Andersson Jens Berggren Moa Cortobius Anton Earle Karin Lexén Jan Lundqvist Josh Weinberg CONTACT THE EDITORIAL TEAM: WATERFRONT@SIWI.ORG Elin Ingblom is the graphic designer of Stockholm WaterFront Magazine. She works closely with editor Victoria Engstrand-Neacsu, with whom she re-designed the magazine in 2014. “It’s a wonderful challenge and a great responsibility to make each issue feel new and exciting visually, I always look forward to pushing myself and my designs”, says Elin. “The magazine (WaterFront) is an excellent platform for getting our issues out there, and make them accessible to all kinds of readers, not just the highly expert, scientific crowd.” Elin Ingblom has previously worked with graphic design in London and joined SIWI in 2011. Photo: Elin Ingblom Disclaimer: The opinions expressed within this publication are those of the authors and are not necessarily shared by SIWI or its affiliates.